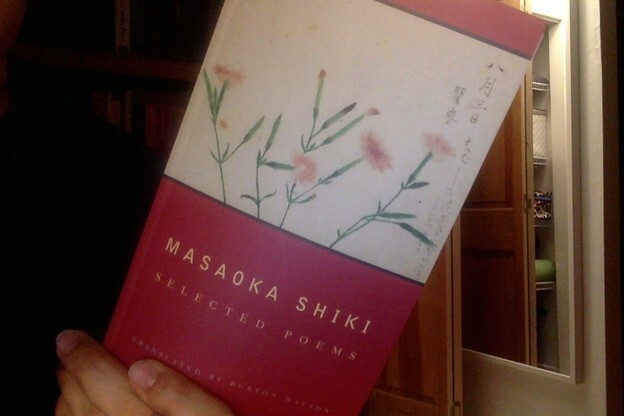 Bibliography: Masaoka Shiki: Selected Poems, translated by Burton Watson (Columbia University Press, 1997). ¶ A few words from Watson's Introduction: "The first poet to compose hokku of true depth and artistic stature was Matsuo Bashō (1644–1694), who is regarded by many as the greatest haiku poet of all time. [ . . . ] Two other poets in the years following who wrote haiku of outstanding quality were Yosa Buson (1716–1783) and Kobayashi Issa (1763–1827). These three, along with Masaoka Shiki, make up the four masters of the form...."
Comment: I've written elsewhere about a luminous book, wonderful to share with people, called Bashō and His Interpreters (Stanford, 1991). One of the great merits of that book is it teaches you that the white space around any given haiku is alive, is crowded with activity. It's like watching baseball. The person who doesn't know anything except the rules of the game can only see the plays. But the person who knows all the people's names and the statistics and the general history of the teams can perceive a great deal of drama, comedy, satyr play—even when nothing is actually transpiring on the field. The simple act of switching pitchers can make a well-informed person explode. Like many USA poets, I am a great admirer of Robert Haas's The Essential Haiku (Ecco, 1994), which focuses on the "big three": Bashō, Buson, Issa. I believe most people in my milieu prefer Issa. I don't know if they would admit it. Anyway I had never heard of Shiki, 'til I bought the book pictured above, eleven years ago, trusting, as always, to Burton Watson's good taste. It appears from his Introduction that he came to Shiki somewhat late himself. He did some translations for the anthology From the Country of Eight Islands (University of Washington, 1981), found himself thoroughly charmed, fifteen years passed, and voilà. Watson was around seventy-two when Masaoka Shiki: Selected Poems came out. He'll be ninety-one in June. * Pictures of the Buddha "entering nirvana" (i.e., on his deathbed) typically show him lying on his side surrounded by monks, gods, animals, birds, and other beings—all weeping and lamenting inconsolably. * Kawahigashi Hekigoto (1873–1937) was one of Shiki's closest friends and followers.